The performance of optical coatings for high power DUV/VUV laser applications depends amongst others on residual absorption in the thin film layers due to impurities or defects. We demonstrate the high potential of the laser induced fluorescence for detecting particular absorbing species even within the small interaction volume of optical thin films. Using pulsed ArF laser induced fluorescence measurements (LIF), characteristic non-intrinsic emissions of praseodymium, cerium and hydrocarbons are identified in fluoridic single layers on silicon substrates and high reflecting mirrors on CaF2 substrates. For praseodymium, additional direct and absolute absorption measurements using IPHT’s LID technique (laser induced deflection) show the influence of different impurity content on the absorption of high reflecting mirrors. Laser induced fluorescence measurements (LIF) are a common way to sensitively detect small traces of defects or impurities in several media such as bulk materials, liquids or gases. In the thin film community, however, LIF measurements are only rarely used so far for investigations. This is possible due to the very small interaction volume between the excitation laser and the thin film and therefore the expected very weak fluorescence signal. On the other hand, defect densities in thin films due to the manufacturing process are expected to be larger than for the corresponding bulk material. Figure 1 shows the ArF laser excited LIF spectrum (H=15 mJ/cm2, f=10 Hz) for a single LaF3 layer of only 50 nm thickness deposited onto a silicon wafer. The silicon wafer as substrate material is chosen since it has been demonstrated that silicon shows no fluorescence upon 193 nm excitation. Therefore, all detected fluorescence originates from the deposited thin film. The spectrum is taken using a recording duration of 10 µs. The LIF spectrum consists of two sharp peaks at 250 nm and 270 nm, a double peak between 280 nm and 310 nm and a broad peak around 430 nm with a small peak at 400 nm. From reported data in the literature the observed emissions are presumably due to traces of trivalent praseodymium (250 nm, 270 nm and 400 nm), trivalent cerium (285 nm and 305 nm) and hydrocarbons (430 nm). One main goal of LIF investigations is to correlate the directly measured absorption data to particular defects or impurities in order to get a better understanding of the residual absorption within optical coatings. 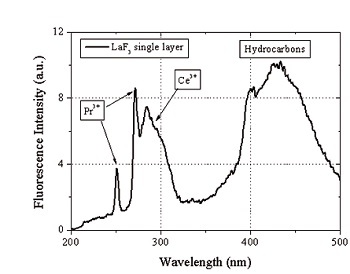 Figure 2a shows the LIF spectra of several high reflecting (HR) coatings (designed for 193 nm applications, combination of LaF3 and MgF2) in the wavelength range 240…280 nm indicating different quantities of praseodymium. For these comparative measurements the recording duration for the spectra is 1 µs taking into account the fluorescence lifetime of the praseodymium emission. 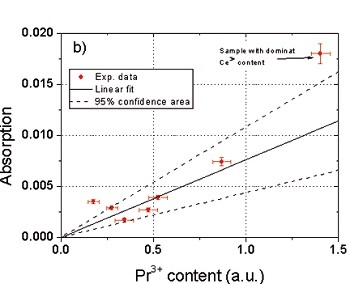 Figure 2b shows the absorption data obtained for the different HR coatings as a function of the praseodymium content (in arbitrary units). 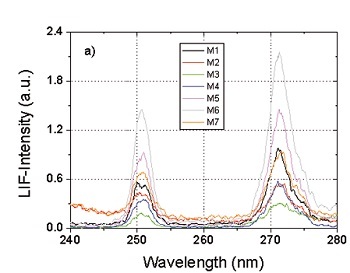 Except from one sample (M6), having additionally a very dominant Ce3+ fluorescence, there is a reasonable good correlation between the Pr3+ fluorescence intensity and the measured absorption. As a conclusion, residual amounts of praseodymium are one factor that needs to be considered when optimizing the absorption in HR coatings for 193 nm applications. Institute of Photonic Technology e.V.